A biomedical engineering major at Johns Hopkins is using high-tech equipment to conduct ground-breaking research to help scientists find out how human tooth enamel is affected by acids that reach the mouth through a common digestive disorder. His work has been supported by an undergraduate research grant from the university. Alan Braly, a 20-year-old junior who grew up in Goffstown, N.H., stumbled into tooth enamel testing last year while looking for a research project within the Department of Materials Science and Engineering. 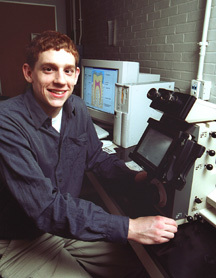 Timothy Weihs, an associate professor who had been supervising tooth enamel research, offered Braly a place in his lab. Initially, Braly wanted to compare healthy teeth with those taken from people suffering from acid reflux. This disorder causes stomach acid to back up into the mouth, where it can come into contact with and break down enamel, the tooth's tough outer layer. Alan Braly is conducting research to find out how human tooth enamel is affected by acids that reach the mouth through a common digestive disorder. As the project proceeded, however, Braly and Weihs discovered that before they could look at the effects of acid, Braly need to conduct more basic research concerning variations in the stiffness and hardness of enamel across the surface of a typical tooth. For these tests, Braly used a device called a nanoindenter. This instrument employs a computer and a microscope to define a set of locations where a diamond-tipped rod will push down into the enamel. The device allowed Braly to measure mechanical properties of tooth enamel, including stiffness (how easily the material bends or springs back to its original shape) and hardness (how well it resists permanent deformation from an outside force). When these measurements are completed, Braly hopes to learn more about why enamel has different properties in different areas of a tooth. "We're trying to find out if it has something to do with the molecular structure of the enamel or its chemical makeup," Braly said. Braly was delighted that Weihs gave him the chance to take the reins of a complex research project. "When I started in this lab," Braly said, "I thought I'd be spending most of my time setting up equipment and cleaning test tubes. But this has really been my research project. I work closely with Tim, but I get a say in what tests to run and what the parameters will be. The results are a product of what I'm doing, not just what someone told me to do." 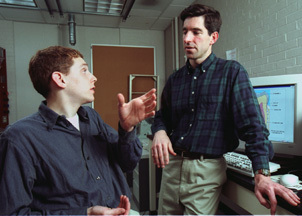 Undergraduate Alan Braly, who is studying the effects of acid on tooth enamel, confers with his faculty sponsor, Timothy Weihs, an associate professor of materials science and engineering. As one of 43 Johns Hopkins students who received a Provost's Undergraduate Research Award in the 2000-2001 academic year, Braly will present an overview on his project during an upcoming awards ceremony. The event will take place 3 to 6 p.m. on Thursday, April 5, in the Mattin Center on the Homewood campus, 3400 N. Charles St., in Baltimore. The Provost's Undergraduate Research Awards is one of these research opportunities, open to students in each of the university's four schools with full- time undergraduates: the Krieger School of Arts and Sciences, the G.W.C. Whiting School of Engineering, the Peabody Conservatory and the School of Nursing. Since 1993, about 40 students each year have been awarded up to $2,500 to propose and conduct original research, some results of which have been published in professional journals. The awards, begun by then provost Joseph Cooper and funded through a donation from the Hodson Trust, are an important part of the university's commitment to research.